These are assorted small birchbark rogans. Rogans are birch bark baskets made by the Attikameks in Quebec, Canada. The baskets were traditionally used by women collecting berries in the forest and for storing food. They are made from birch bark that has been tied together with spruce roots. The rogans have smoked moose hide straps, unsmoked moose hide straps, or deer leather straps. Usually, the rogans are decorated with designs of flowers and animals that have been scraped into the bark. Some large containers are used as clothes hampers. Each rogan is unique. We do have have some standard sizes in stock. 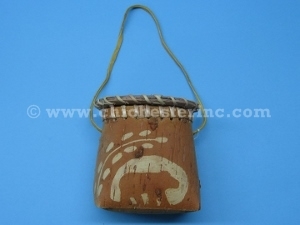 Most of the larger rogans are catalogued individually and you can see our Gallery of unique birchbark rogans for sale. Sizes vary and are approximate.